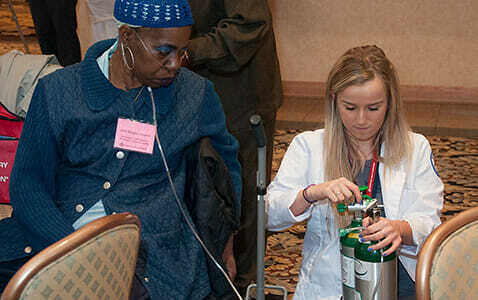 Supplemental oxygen is often prescribed for people with severe COPD. Changes occur in the lungs of COPD patients. These include narrowing of the airways and the destruction of lung tissue, which can make it harder to breathe. Therefore, the amount of oxygen that reaches the blood is not enough to meet the body’s needs. Oxygen therapy can help control this problem. Oxygen therapy can improve a person’s ability to exercise. It can also improve sleep and thinking skills. Talk with your health care provider to decide if oxygen therapy is right for you or the person you care for. Oxygen therapy is prescribed based on one of a few different tests. Your health care provider will suggest tests to see if oxygen therapy is a good fit. There are several types of oxygen systems. Your health care provider can help decide which oxygen therapy device is right for your lifestyle or the lifestyle of the person you care for. The most commonly used system at home. These systems produce oxygen by concentrating the oxygen that is already in the air and eliminating other gases. A portable version is available that allows user flexibility outside of the home. These systems, weighing less than eight pounds, are designed for greater mobility. They are typically small enough to be carried in small side packs. These systems allow larger amounts of oxygen to be stored in smaller, more convenient containers than compressed oxygen. However, they cannot be kept for a long time because the liquid oxygen can evaporate.